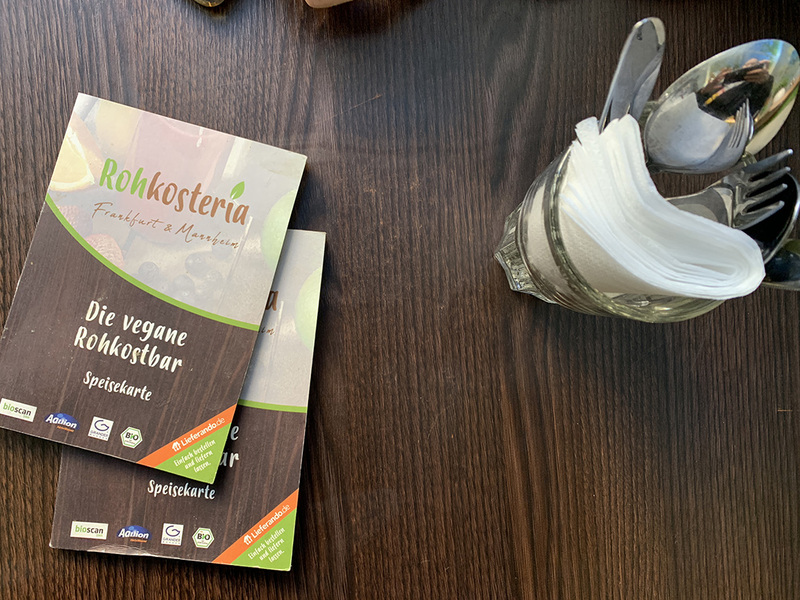 Our friends recommended us Rohkosteria, they are a healthier raw vegan restaurant, they use spouts, less oil than other restaurants, hemp seeds instead of cashews and are certified organic. 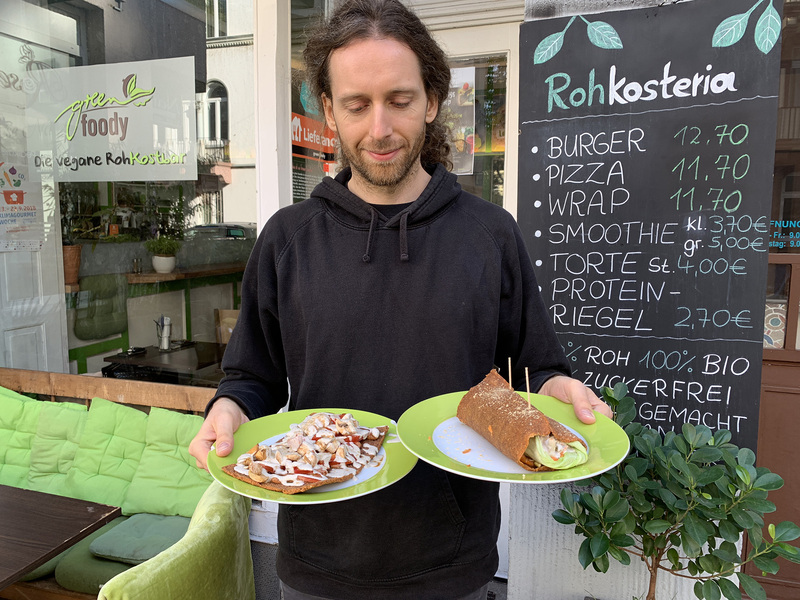 On our way from Mainz to Hamburg we planned to spend a long brunch at Rohkosteria, we didn’t stay for as long as we planned and here is why. 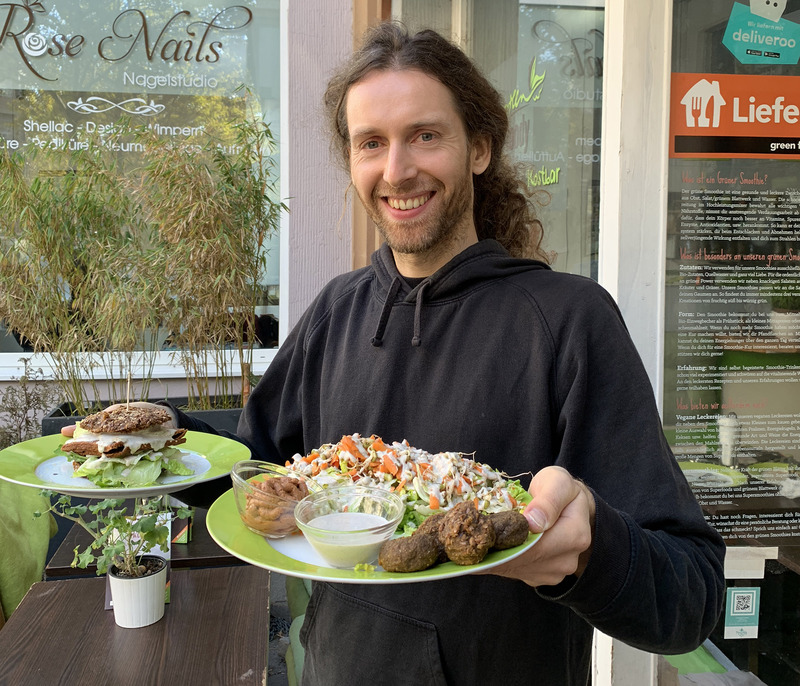 It’s one of the few raw restaurants in Germany and we couldn’t have missed the opportunity to try some new raw vegan dishes. The restaurant was easy to get to by car and the street parking was not to bad, and it’s free in Frankfurt it seems. 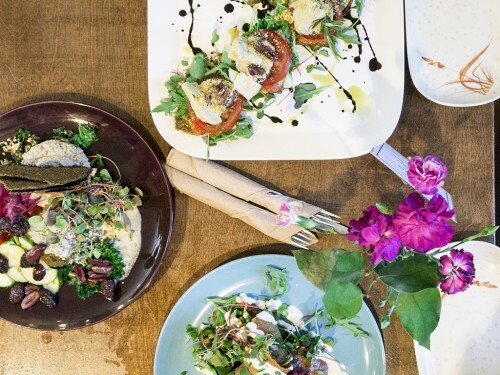 I would always pick Rohkosteria over any regular restaurant, they have organic salads, smoothies, cakes, the ingredients are much better and valuable that they would use at a regular restaurant. I wasn’t super happy with what I had nevertheless and I will provide a detailed review for every dish. Before you continue reading, keep in mind we went there in the late autumn, the variety of organic ingredient at this time of the year is not great and the produce is expensive, the food might be better during the warmer season. 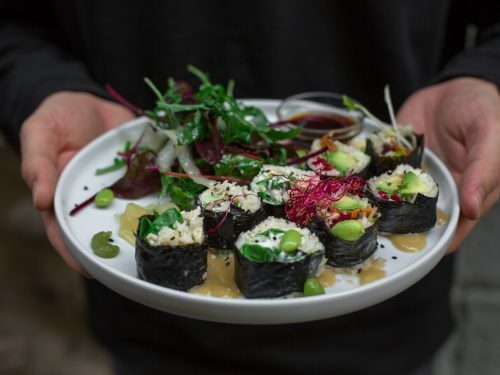 I totally recommend raw foodies to try out Rohkosteria, for a meat eater who just wants to try his or hers first vegan dish, the food will not be convincing I would say. 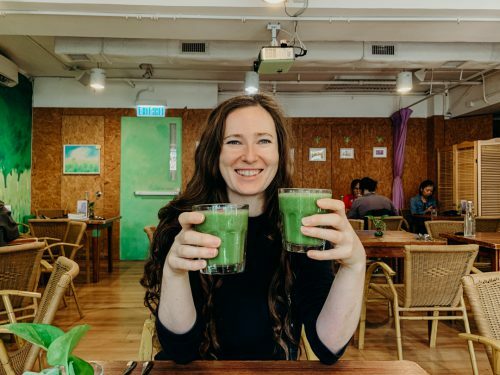 I’m a raw foodie and have been to many raw vegan restaurants all over the world and I know what one can expect, what’s the range of dishes and what an average raw dish tastes like. 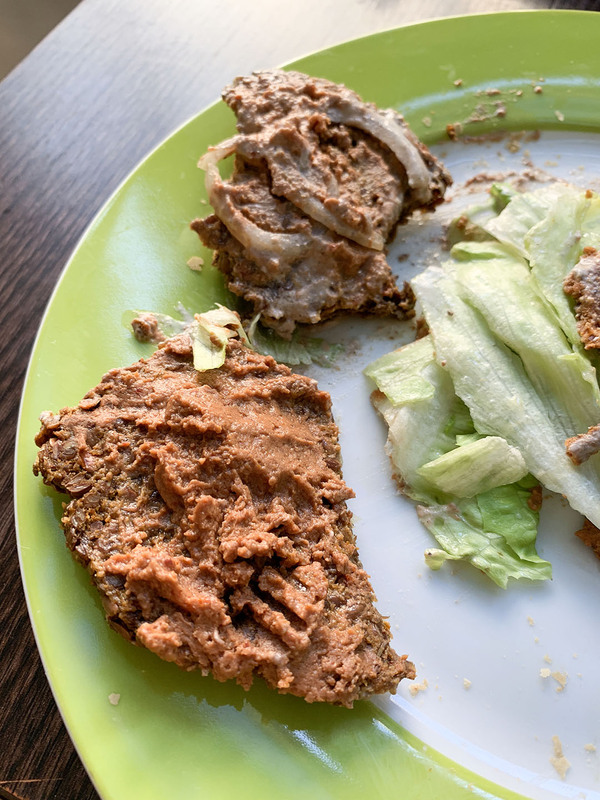 I try to approach the dishes naively though, asking myself how I would like the dish if I wasn’t a raw foodie and would try raw food for the first time. 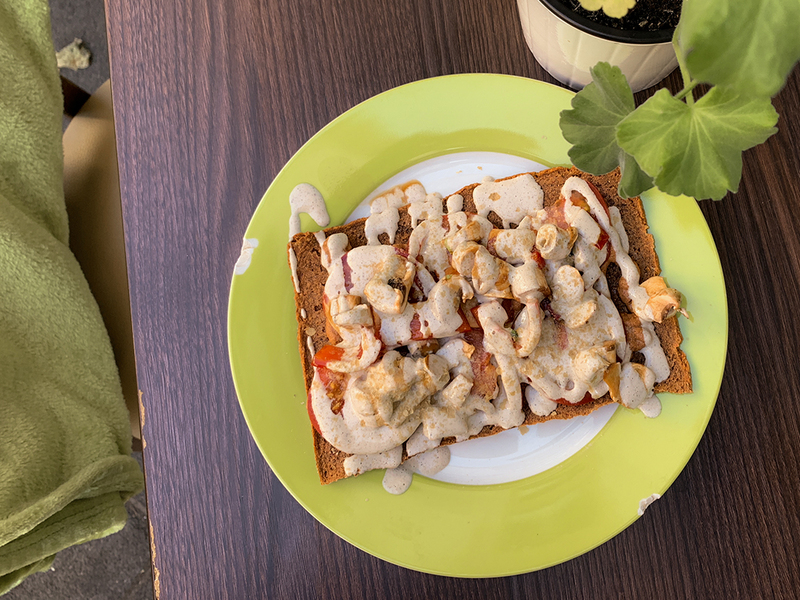 It helps me to be more critical with the food and not to like it just because it is raw, but also not to be too pick and not to compare it with the best raw food I’ve ever had or make myself. Let’s see what we had! We ordered everything on the menu I knew I wouldn’t dislike just based on the ingredients, so no zucchini based dishes like noodles or lasagne, with only taste good to me when prepped to order. Peanuts, dates, carob, hemp seeds. The peanut torte (4 €) was great. It tasted like a fluffy cheesecake. 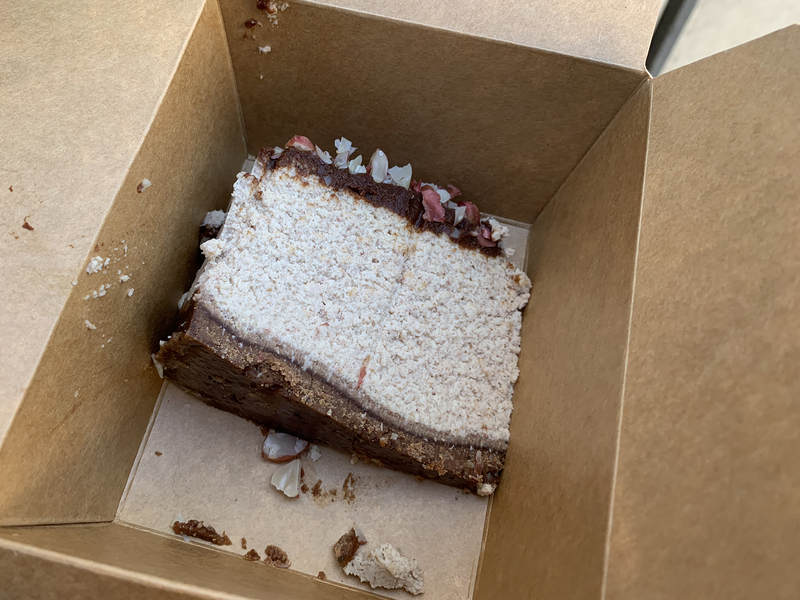 I asked about the ingredients and was told about the listed above but cake cream was actually coconut based, flakes and oil I guess, If I knew about the coconut, I wouldn’t have tried it. The cake was definitely the best thing we tried today and the only thing I would order again at Rohkosteria. 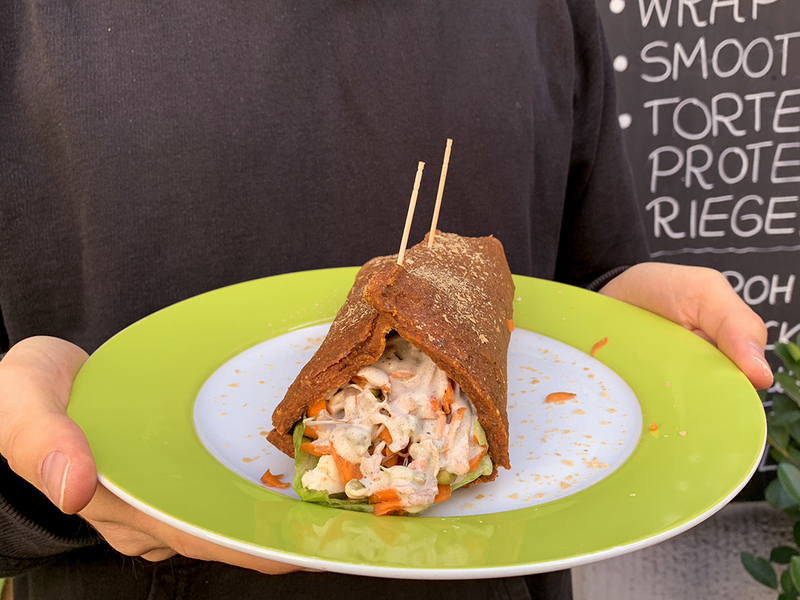 This wrap (11,70€) was the first dish we had and I was super excited about it. It looked great at first but was surprisingly boring once I opened it up. The filling was a salad of napa cabbage, carrots, cauliflower, mung bean sprouts and hemp dressing. 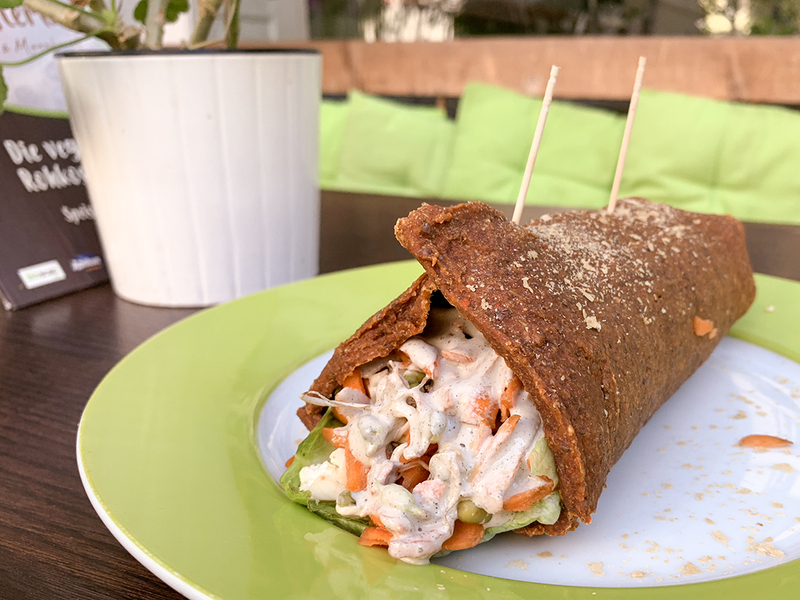 The tortilla wrap was good, but the description promised more: fresh veggies, creme of herbs, wild herbs and walnut pesto were nowhere to find in the wrap. From here on things went south. All the dishes were more or less a repetition of the wrap plus one additional ingredient. Before ordering, we asked what dishes are the best, prettiest and must try and whether they are out of something. 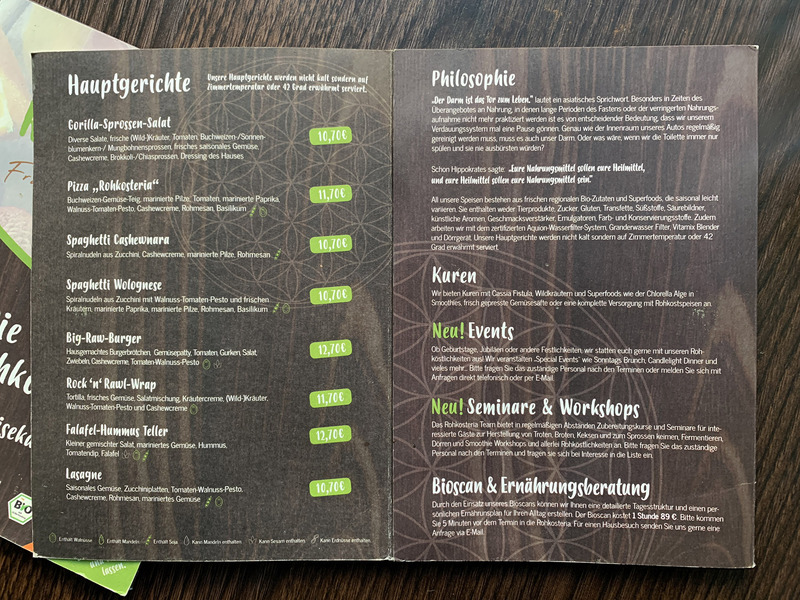 They clearly were out of some main ingredients, but didn’t tell us, that all the main dishes are basically identical and we should try the starters, more cakes or something. The pizza (11,70€) wasn’t great. 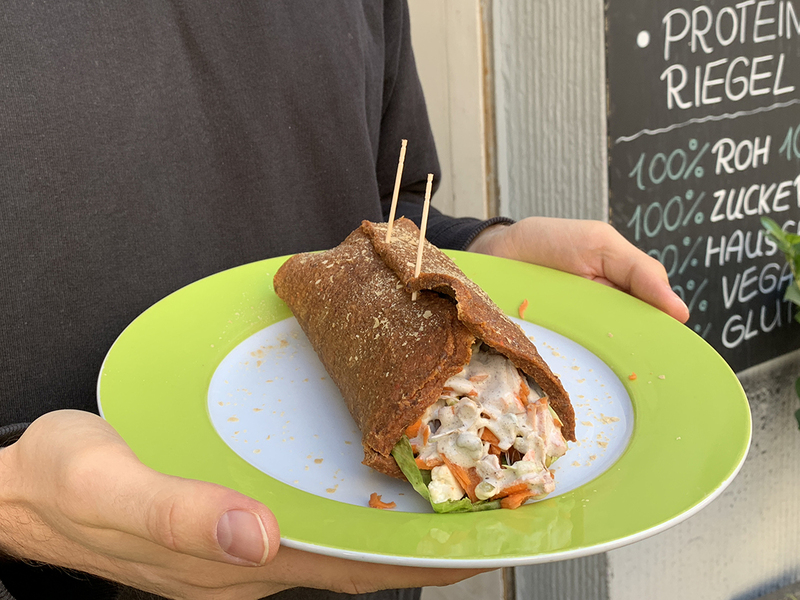 The promised dough (Teig) was just a smaller tortilla wrap topped with a walnut tomato pesto, mushrooms, tomato and hemp sauce. There was no promised bell pepper, cashew cream, rawmesan, or basil. There were some nutritional yeast flakes on top. The mushrooms were drowned in the hemp dressing are didn’t taste like much, but the tomato pesto was so overly salty, that it almost compensated the blandness of the mushrooms, if it wasn’t bitter. 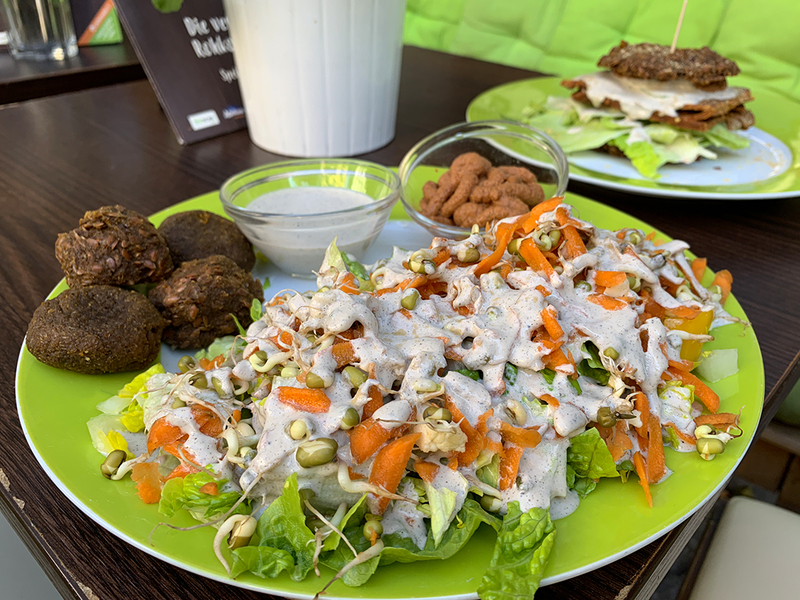 The falafel plate (12,70€) was a disappointment. The salat was pretty decent size, but it consisted as all the side salads many of napa cabbage and carrots with bite of cauliflower, ingredients, I wouldn’t expect at a decent restaurant in a salad or use at home for my own salads. 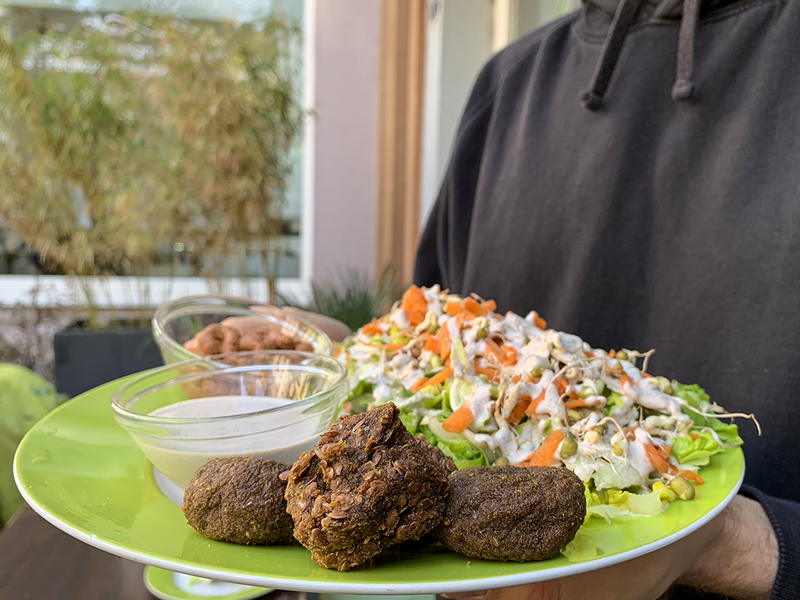 The falafel were disgusting. They were slimy soft on the inside, I cant imagine how this difference in consistency on the inside and outside could occur if one dehydrates at low temp. The hummus is a hemp dressing again, really? And the over-salted tomato pesto? Stefan found the falafel tasty, but a little sour (probably fermented from being not properly dehydrated), he also found the texture was bread-like dense. I expected the burger (12,70€) to turn the not so satisfying meal around, but it didn’t. The worst thing was the fermented bun. It was too soft and moist on the inside and probably sitting for too long in the fridge, it tasted and smelled completely disgusting. 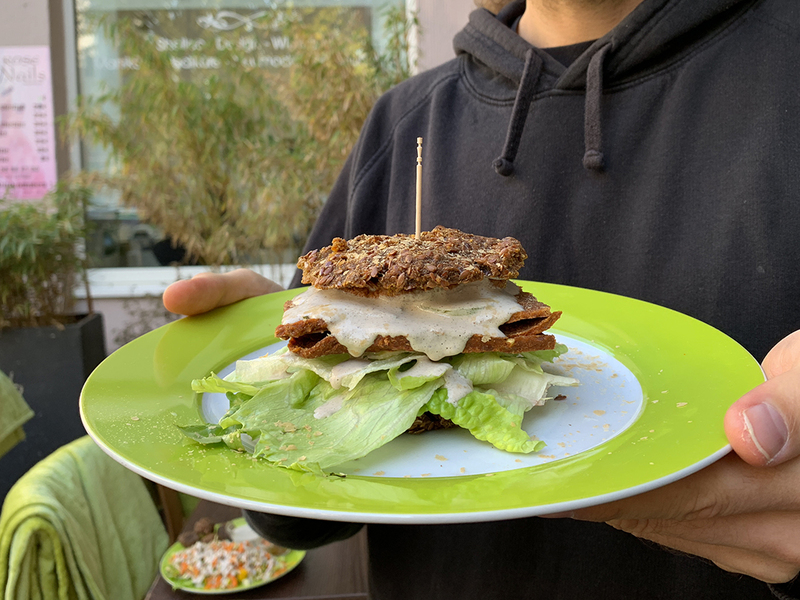 The burger was missing a veggie patty, instead a cut up tortilla made it final appearance in the 4th dish posing as a patty. 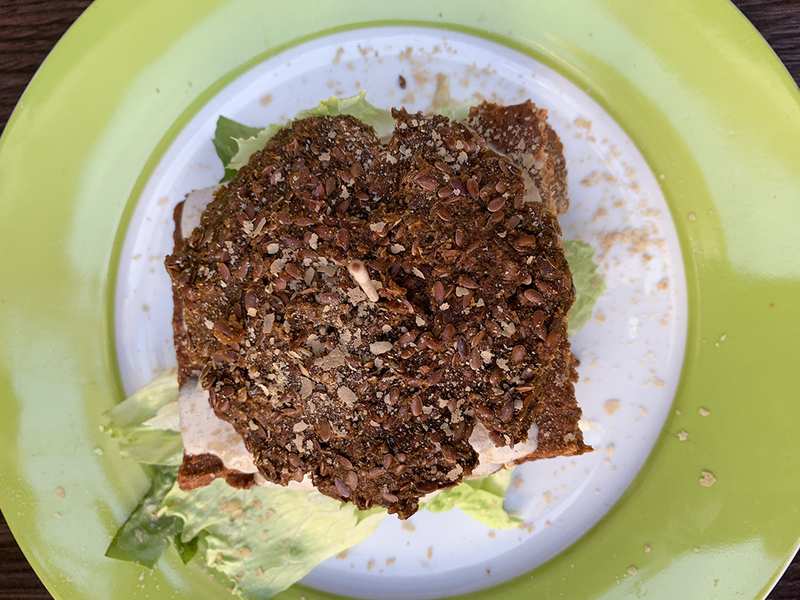 There was a paper thin cucumber slice, 2 onion slices, lots of hemp dressing, a lettuce leave and the salty pesto in the burger. The burger bun was really bad. The menu was decent, 5 main dishes, but the menu was not up to date, many components were swapped, and the 4 dishes we tried were basically all the same. The cake display didn’t seem too inviting, the cakes on the left looked not raw cake pretty. The prices are good, a main dish a little more than 10€ tax included is not too bad at all. The cakes are also not expensive at all. We asked for no extra oil and the kitchen swaps out an oil-based salad dressing for an oil-free one. The waining time was short. We were the only guests at the restaurant and got served immediately. However, the cake never made it to our table, so we took it to go. The food is certified organic, the raw ingredients were fresh, the dehydrated thicker bread and falafel were bad. The food didn’t taste like much, partly bad. The dishes were laking creativity, variety or attention to detail. The portion sizes we great, we had 2 mains each and it was too much, even we didn’t eat beforehand. Scale 1 (lowest possible rating) – 5 (highest possible rating). More about how I rate the restaurants here.